HKS Inc, a global architecture firm with a rapidly growing reputation for sustainable design has another LEED certification to add to their credentials — their own office in Atlanta. 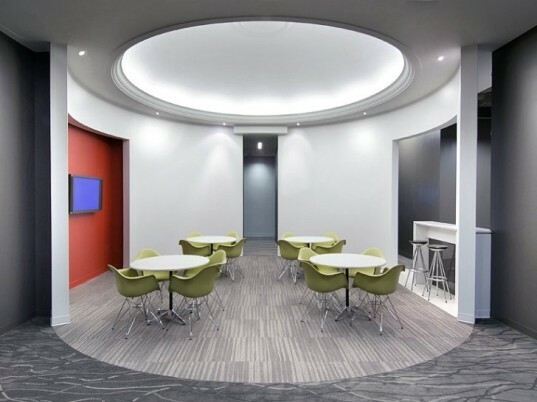 Located in 191 Peachtree Tower, the tower was awarded a LEED Silver rating under the EBOM (Existing Buildings, Operations & Maintenance) rating system in 2007, and now HKS's own revamped offices have been awarded LEED Gold for Commercial Interiors. The interior design team placed a strong focus on water reduction, energy efficiency, sustainable materials, maximizing furniture and equipment reuse, and recycling construction waste. To achieve LEED Gold CI, the HKS interior design team focused on water reduction, energy efficiency, sustainable materials, maximizing furniture and equipment reuse, and recycling construction waste. HKS upgraded to low-flow water fixtures to achieve a 30% reduction in potable water use. No changes were made to the HVAC system as the base building’s equipment was already efficient, but they did upgrade lighting fixtures, the lighting layout and the power density to reduce energy use by 20%. HKS buys enough renewable energy credits to offset their energy use. They sourced eco-friendly materials that took into consideration recycled content, manufacturing location and the presence of toxic chemicals. During construction they recycled almost 80% of their construction debris and they reused all their old furniture from their previous office. 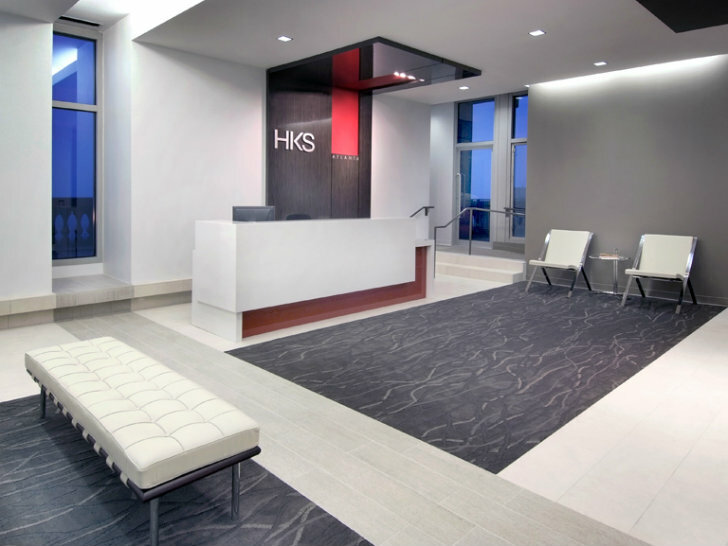 HKS Inc moved into their top floor offices in the Peachtree Tower after the King & Spalding law firm moved out. Taking advantage of the building's exterior balconies and sweeping views of the Atlanta skyline, HKS maximized their space and expanded upon the existing sustainable strategies already in place in the office tower. To achieve LEED Gold CI, the HKS interior design team focused on water reduction, energy efficiency, sustainable materials, maximizing furniture and equipment reuse, and recycling construction waste. HKS upgraded to low-flow water fixtures to achieve a 30% reduction in potable water use. No changes were made to the HVAC system as the base building's equipment was already efficient, but they did upgrade lighting fixtures, the lighting layout and the power density to reduce energy use by 20%. HKS buys enough renewable energy credits to offset their energy use. They sourced eco friendly materials that took into consideration recycled content, manufacturing location and the presence of toxic chemicals. During construction they recycled almost 80% of their construction debris and they reused all their old furniture from their previous office.